The family is excited about the changes they see in Zoe, 12 and young Joshua, 6. “I have seen great changes in both of my children. They have grown to be more responsible, focused, driven, confident and have a sense of accomplishment because of Tae Kwon Do,” Dad states. This month’s profile tells us more about Zoe and Joshua. What are your belt levels? 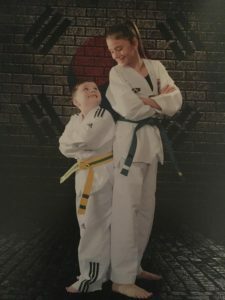 Why did you start Tae Kwon Do? Zoe attended a class for the bring a friend event and loved Tae Kwon Do from then on. Joshua has always been interested in martial arts and wanted to learn more about it. Master Shim’s has helped them to become more focused and have more confidence overall. Zoe and Joshua like Tae Kwon Do for many reasons. They like being able to take care of themselves if needed. They like the masters and instructors too. They think it is a lot of fun to do. Tell me about some of your Tae Kwon Do accomplishments and things you have achieved? Zoe feels accomplished for becoming a member of the Demo team as well as a junior instructor. Joshua has been excited about becoming a high belt. He also loves competing at the tournaments and bringing home medals to show everyone.